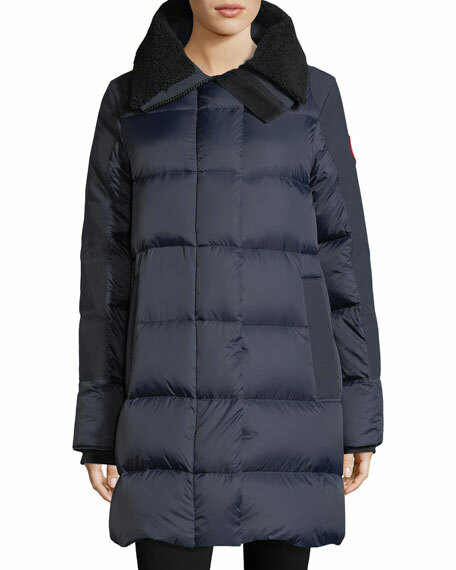 Canada Goose "Chelsea" parka with 625 fill power white goose down. 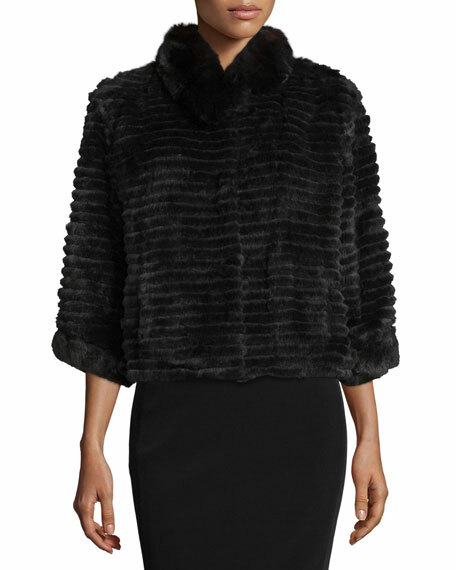 Removable hood with natural coyote (Canada) fur ruff. Interior security pocket with zipper closure. Heavy duty two-way YKK® zip closure. Slim fit; inner draw cord waist. Cashmere-blend collar, cuff and waist; pockets lined with sueded tricot for extra durability. Layered, dyed rex rabbit (Spain) offers unique velvet-like density. Approx. measurements: 21"L down back, 13"L from shoulder to hem. Stand collar; hidden button/clasp front. Half sleeves. Bolero style. Polyester lining. Professional fur specialist clean. Imported. Herno "Nyltft" parka in shiny quilted puffer fabric and tech taffeta. Wide funnel collar; detachable hood. Two-way zip front. Long sleeves. A-line silhouette. Side slip pockets. Above-knee length. Nylon top outer shell. Polyester hood/bottom. 90/10 down/feather fill. Imported.